The Princeton-based architectural firm ikon.5 Architects has been awarded a Merit Award in the Unbuilt category by the New Jersey chapter of the American Institute of Architects (AIA-NJ) for its design of a new Training, Recreation and Education Center for the Newark Housing Authority. 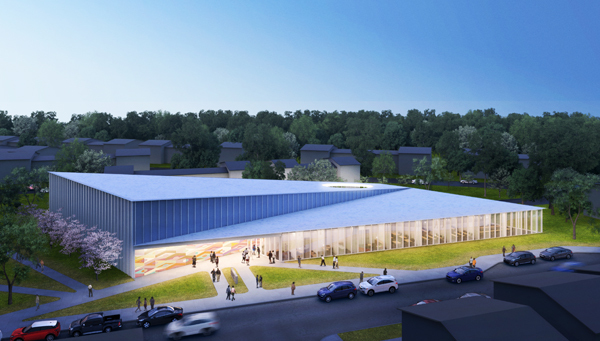 The community center will feature a gym, aerobic room, meeting rooms and childcare center. Its design was inspired by its location in Newark, and it will benefit the surrounding community. As conceived by ikon.5, the community center will be housed in one building composed of two interlocking triangular wedges. One wedge is transparent, and is designed to contain meeting and educational facilities, while the adjacent building, with its opaque walls, will be used for recreational activities. The unique creation was inspired by the geometric clash of the city’s urban grid and idyllic Weequahic Park in southern Newark. The 22,000-square-foot building will feature a gymnasium, fitness and aerobic room, community meeting rooms, locker room and showers, childcare center, and a library and study area. The center is a welcomed addition to the surrounding community and is expected to rejuvenate the residential community. The project was commissioned by the Newark Housing Authority and will serve the residential Dayton Neighborhood in the South Ward of Newark. The United States Department of Housing and Urban Development and the New Jersey Economic Development Authority both contributed funding. The AIA-NJ Annual Design Awards program recognizes architectural projects that exhibit design excellence in one of four categories: Open (meant for any building type), Residential, Historic Preservation and Interior Architecture. Projects are further designated as either Built or Un-built. To be eligible, projects must be either located in New Jersey or designed by an AIA-NJ architect. Submitted projects are evaluated during the organization’s annual Design Conference by a group of distinguished architects from throughout the country. For more information, visit www.aia-nj.org.